"The Supreme Court is wrong on the Second Amendment"
A secretly recorded speech at an unknown location features Hillary Clinton vowing to launch a new effort to ban assault weapons if she becomes president. "So I'm going to speak out. I'm going to do everything I can to rally people against this pernicious, corrupting influence of the NRA," Clinton asserts. "And we're going to do whatever we can. I'm proud when my husband took them on and we were able to ban assault weapons but he had to put a sunset on it so, 10 years later, of course, Bush wouldn't agree to reinstate them." "We've got to go after this," Clinton urged. "Here again, the Supreme Court is wrong on the Second Amendment and I am going to make that case every chance I get." "The location and date of the recording are unknown. It sounds like an intimate room and was likely recorded on a cell phone or similar device. The Republican National Committee, which posted the clip on YouTube, has not provided additional details," writes Kyle Olsen. 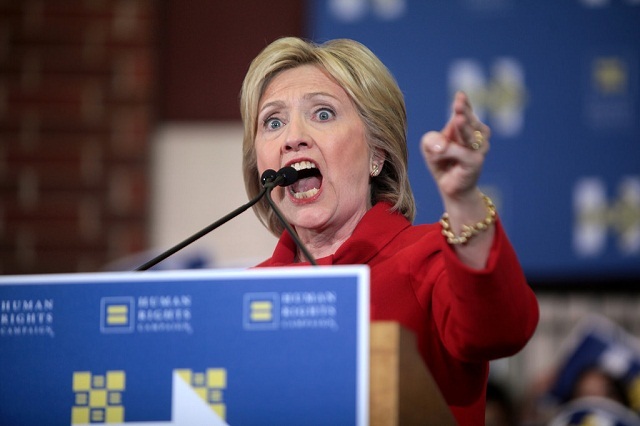 Hillary's appetite for gun control has cropped up on the campaign trail numerous times. Last month during an event in Philadelphia, Clinton vehemently agreed with a supporter who urged her to use executive orders to restrict the Second Amendment. During a round table discussion in New York, the former Secretary of State nodded along vigorously as a member of the panel described gun owners as terrorists. "Citizens are the terrorists, right?" the woman states as Hillary nods multiple times. "We're so worried about terrorism but we have terrorism on our own soil," she continued. Hillary's daughter Chelsea also gave a speech following the death of Supreme Court Justice Antonin Scalia urging Democrats to exploit his absence to pass strict new gun control laws.